Nashville, Tenn. – Nashville Predators President of Hockey Operations/General Manager David Poile announced today that the club has signed goaltender and 2011 second-round pick Magnus Hellberg (MAG-nuhs HEL-buhrg) to an entry-level contract. Hellberg, 21 (4/4/91), played his first season with Frolunda of the Swedish Elite League (Elitserien) in 2011-12, posting a 2.64 goals-against average and a .904 save percentage. He also saw action last season with Frolunda’s junior team and Orebro of Sweden’s second league (Allsvenskan). The 6-5, 185-pound native of Uppsala, Sweden led all juniors and ranked second among all Allvenskan netminders in save percentage (.936) and goals-against average (2.04) with Almtuna in 2010-11, in addition to ranking fourth in Sweden’s second division in shutouts (5). 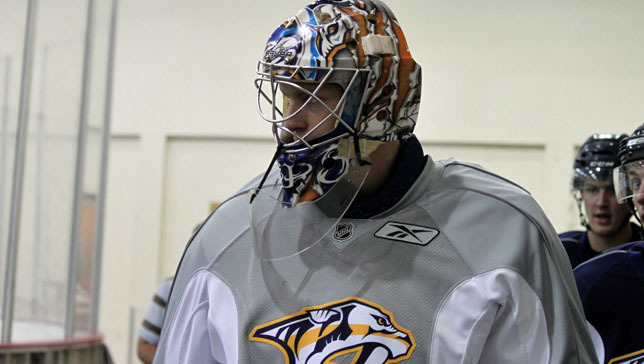 Nashville’s first choice, 38th overall (second round), in the 2011 Entry Draft led the Swedish Junior League in save percentage (.928), goals-against average (1.97), shutouts (4) and games played (22) with the Almtuna Under-20 squad in 2009-10.